Situated in the Bernese Alps, Switzerland, Interlaken is surrounded by two lakes, Thoune and Brienz, which create the site’s magnificence. 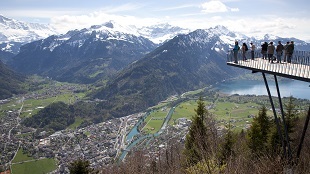 Developed from the 12th century around the Augustin convent, the town of Interlaken continued to spread until the arrival of the first railway at the end of the 19th century, allowing the town to welcome its first tourists and mountain lovers. Nowadays, Interlaken is so appreciated for its scenery and tranquil surroundings that you can even find a replica of the town in China on the outskirts of Shenzhen! The resort offers summer and winter activities alike for sledging fans or, for the more daring, there is trekking across the glaciersthat adjoin the resort. It is also possible to visit the first museum dedicated to tourism in the Bernese Alps in Switzerland. After learning about the Oberland region and its history spanning several centuries, how would you like to fly over this region in a helicopter? Finally, if you have any strength left, you can enjoy a moment of relaxation by bathing in the Brienz lake, renowned for its glacial blue colour. An alternative would be to book a day of relaxation at the wellness centre “Victoria Jungfrau Spa”, where you can delight in the sauna, the steam room or even a flower petal bath. For a total of 220 kilometres from Geneva, the journey takes 3 hours on board one of our chauffeured limousines. In an S500 for 2 people or in a Vclass for a group trip, you can enjoy the Swiss scenery and the various lakes visible on the journey. Let us drive you through the winding paths of the Bernese Alps for your own pleasure before peacefully arriving in Interlaken, where you will begin exploring the beautiful scenery of this fairy-tale resort. For more information or to book your transport to Interlaken from Geneva, please visit our website: https://www.gmc-limousines.com or telephone us on +41 (0)22 732 57 67.